I've been teaching my daughter how to quilt the last few days and she's been doing great. She picked out a paper piece quilt of the month project from the past from Sew Hooked that is a Harry Potter bookcase. She is just finishing block two and I will try to share them this week. I am proud of her progress and believe me if she can learn to quilt and paper piece at the same time, I am sure paper piecing is something everyone can do. Of course, if I say so myself she has a great teacher...he hee. I myself have been making progress on my Skillbuilder BOM blocks. 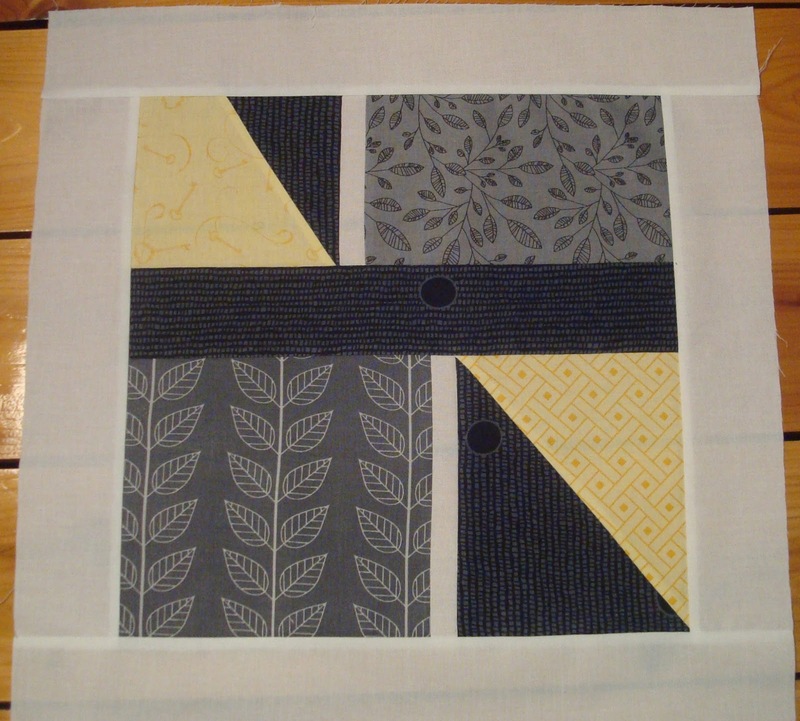 I have been hesistant to commit to fmq--ing my January blocks. For me this is the norm. I am seriously hoping that in doing the FMQ on twenty blocks over the next 10 months that I will grow much more skilled and confident and not so fearful of doing the free motion quilting involved in completing projects. 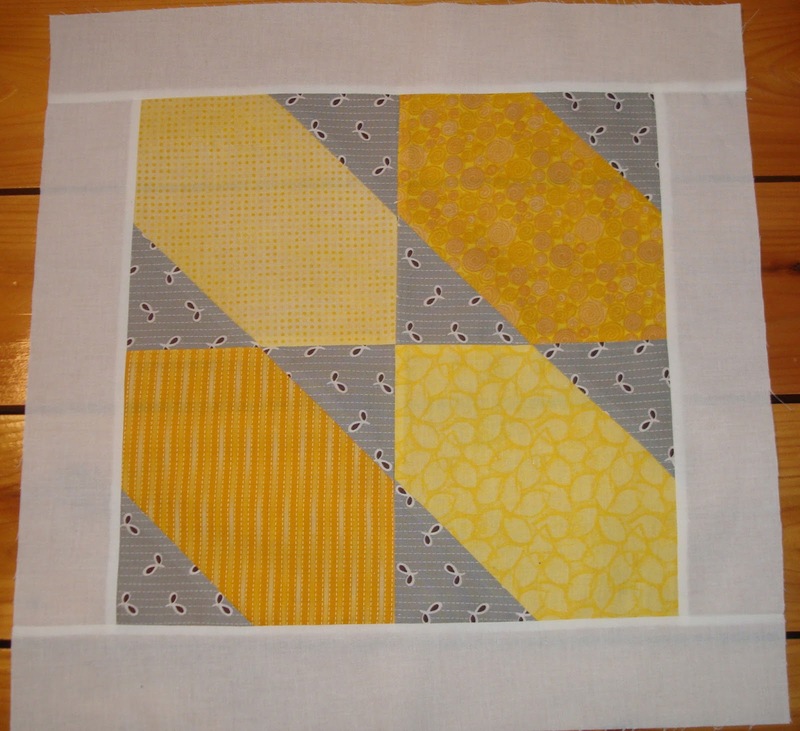 Here is what I have so far done on my January blocks for the FMQ. This is the view from the back. I can see why Alyssa says this is where it works good to have a busy pattern as the backing so it can be much forgiving with the stitches and the thread color changes would blend in better with the proper backing choice. I think I may stick it out with the gray though just for the sake of maintaining the learning curve. I bought a few new threads for doing the FMQ.Not what she recommended. I couldn't find the aurifil Alyssa recommended so I just bought some nice thread but it wasn't the 40 or 50 wt she suggested either. What I could find was 30 wt. 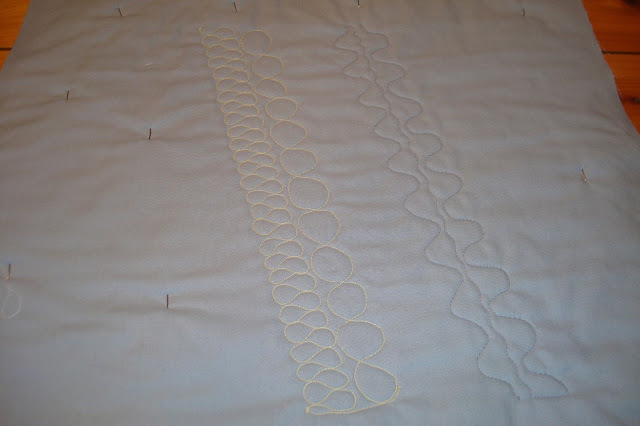 I forgot that I have been zooming thru so many white thread spools lately that I needed to buy more so I thought I would wait to do those areas till I bought more thread. This weekend my daughter and I drove to the coast and stopped at three quilt stores. The had sticker shock at the price of aurifil. Yikes...$13.50 at the first store...$11.99 at the second and I didn't bother looking at the third. I really am going to have to try and win some of this even harder than I have so far. I am going to have to be convinced that it is worth the price. I bought some Isacord 40 wt polyester thread instead for $5.89 . Price was much more to my liking. Alyssa said she likes to use cotton thread but I figured hey I know the Isacord is suppose to be a great product too so why not give it a shot. Especially since this is all new to me to select different threads or weights of threads. I usually just use whatever is cheap, usually Coats and Clark (fancy to me is Guttermann). I bought a spool of Superior King Tut thread almost a year ago and still have not taken the wrapper off it because it is a blended lime green. Not the wisest choice on my part. I hope you can see it. I swear it showed up much better when I viewed the picture. Oh, well the back shows much better. Still have a long ways to go but am gaining confidence. I love how these blocks turn out. Alyssa has us use starch and they look so crisp when they are completed. Very nice to work with. I hope you are enjoying your day. Your FMQ looks great, it is more then I can do. I will have sit at my machine and at least try it. Love you blocks. I love the colors in your Skillbuilder Blocks. Your FMQ looks good to me front and back. 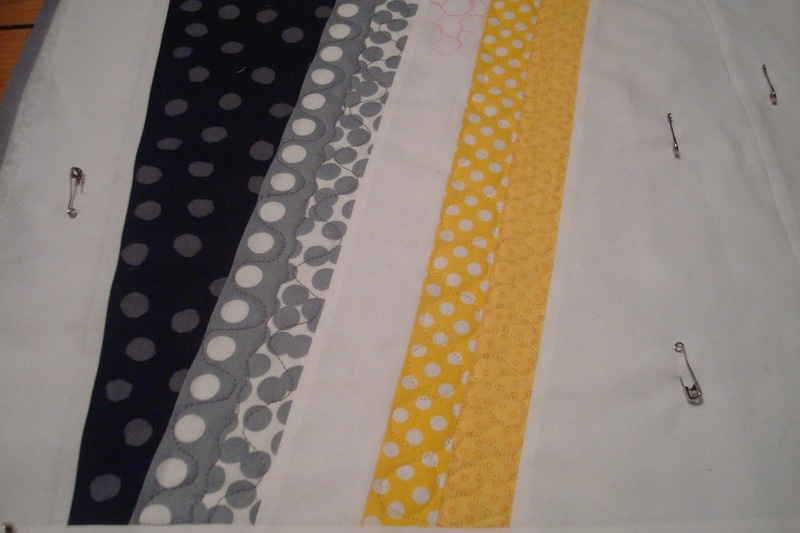 I love the different patterns for each strip.